Our decanter drying rack is simple to use and conveniently dries, protects and displays your decanter. 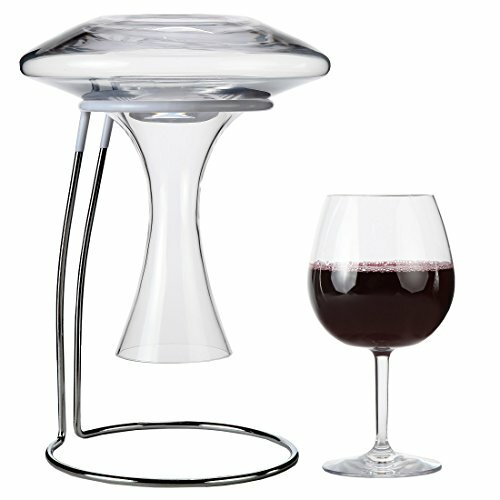 Special rubber coating on the top of the stand protects your decanter from scratching. This chrome plated steel decanter drying stand not only air dries your decanter to a spot-free finish, it doubles as a decanter rack for all standard size decanters. Lightweight. Measure: 10-1/2" tall x 7-3/8" diameter at the base and 5" inside diameter at the top.Decanter cleaning brush is included. SPOT-FREE FINISH. Dries decanter upside down to prevent pooled water and drip spots. FITS STANDARD DECANTERS. Doubles as a decanter display rack. STAINLESS STEEL CONSTRUCTION. Won't rust or bend. RUBBER COATING. Protects decanter from scratching. Decanter cleaning brush is included. Dimensions: 10.5" tall, 7.5" diameter base, 5" inside diameter top. If you have any questions about this product by Lilyshome, contact us by completing and submitting the form below. If you are looking for a specif part number, please include it with your message. JoyJolt Cigno Wine Decanter Hand Blown Lead-free Crystal Glass Red Wine Carafe 50.72 fl. Oz.